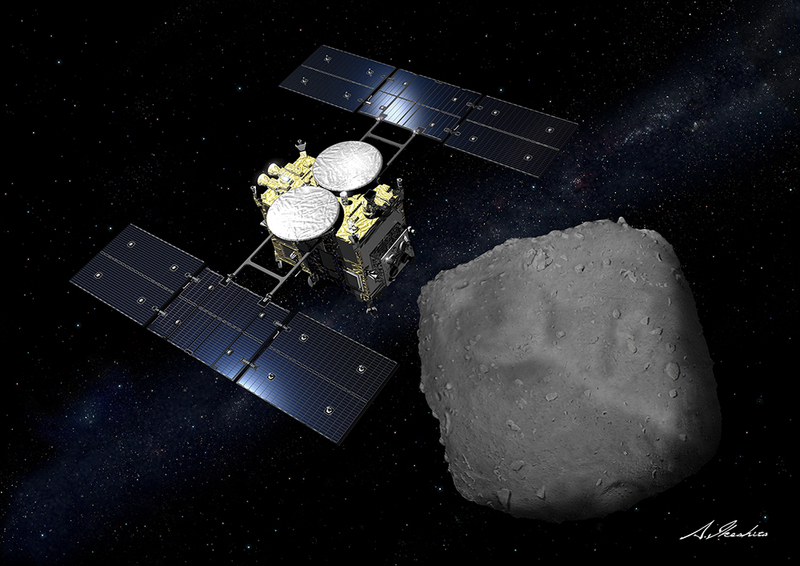 Three research papers have been published this month in the International Journal, Science, detailing the first results from the ISAS・ JAXA Hayabusa2 mission to asteroid Ryugu (1,2,3). After 1302 days in space, Hayabusa2 arrived at asteroid Ryugu on June 27, 2018. 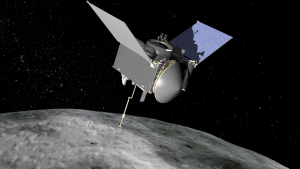 The mission is destined to return to Earth at the end of 2020, bringing samples from the asteroid surface. But upon arrival, Hayabusa2 promptly began a detailed examination of the asteroid using the onboard remote sensing instruments. Asteroids are the leftovers of the planet formation process. Ryugu is a C-type or “carbonaceous” asteroid, a class expected to contain organics and hydrated minerals that have water included in their structure. C-type asteroids are suspected to be the origin of carbonaceous chondrite meteorites that have fallen to Earth. But this connection is difficult to prove as ground observations can reveal relatively little about objects as small as asteroids. Yet, the life cycle of the C-type asteroids from formation through to meteoric descent to the Earth’s surface could be the path to creating a habitable planet. The rocky planetesimals that formed the Earth may have been too warm to contain ice. Water and the first organics would then have arrived on our dry planet from hydrated meteorites, feasibly originating from C-type asteroids. The history of Ryugu is therefore the map that allows us to trace the movement of water from the outer regions of the early Solar System to the terrestrial planets. But how do you follow an asteroid back through time? Near-Earth Objects (NEOs) like Ryugu are thought to have once been part of a larger body orbiting in the asteroid belt between Mars and Jupiter. Collisions can break-up these larger asteroids, creating smaller fragments that can be driven towards the inner Solar System. In the paper led by Suiji Sugita at the University of Tokyo, observations of Ryugu’s surface with the telescopic Optical Navigation Camera (ONC-T) onboard Hayabusa2 support a violent history for the asteroid. The surface Ryugu is covered with boulders and craters. Many craters have raised rims created by a loose surface layer and lack terraced bottoms that would indicate a more cohesively strong material below. 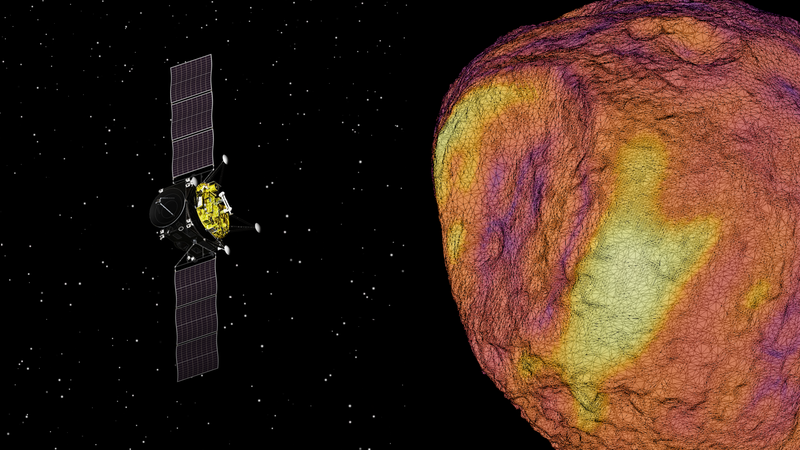 Measurements of the asteroid’s gravity agree with a uniformly loose structure with porosity (measure of the empty space in a material) greater than 50%. This suggests Ryugu is a rubble pile held together by gravity. Smaller boulders on the surface are likely the result of recaptured ejector from the impact craters, while boulders larger than 20m across may be fragments of the original parent body. The sizes and numbers of impact craters on Ryugu can be used to date the asteroid, with higher values indicating a longer history of bombardment. 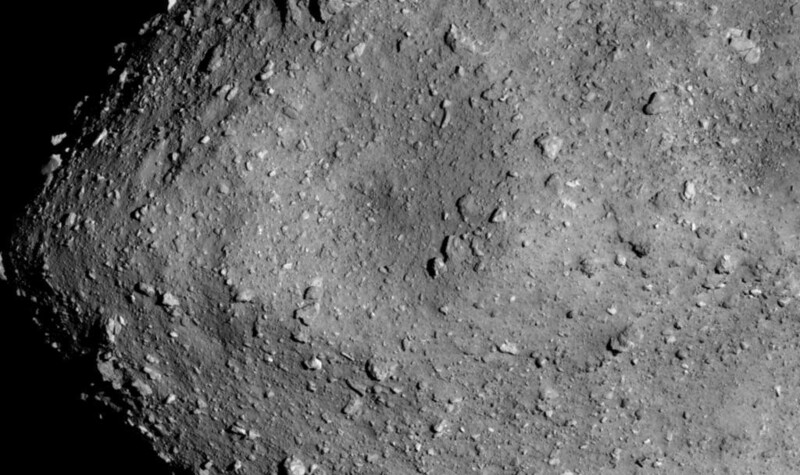 Counts by Sugita’s team place Ryugu’s age between 10 – 100 million years old. Such a wide range is due to uncertainty in the amount of cohesion (or stickiness) on Ryugu’s surface, as the crater size changes over time depending on the ease with which material can slide down the rim. Getting a handle on this value is difficult in laboratories on Earth, where our planet’s gravity dominates over small cohesive forces. Despite this uncertainty, Ryugu’s age is equal or older to the time the asteroid is expected to have been in a NEO orbit. 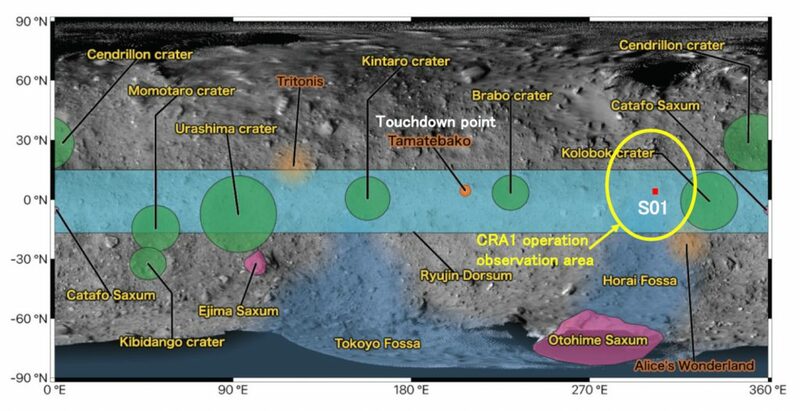 This suggests that the largest craters on Ryugu’s surface may have been acquired while the asteroid was still in the asteroid belt, where the chances of collisions are much higher. The shape of Ryugu resembles a child’s spinning top, with a bulging equatorial ridge and flattened poles. Such a shape is not uncommon among asteroids, but is associated with faster spinning objects than Ryugu. On rapidly spinning asteroids (that includes the destination of NASA’s OSIRIS-REx mission, Bennu), material is pushed outwards by the same centrifugal force you feel on a merry-go-round. But Ryugu’s rotation rate of 7.6 hours produces a centrifugal force that is just 20% of the gravitational pull and too weak to create the characteristic shape. In the paper led by Sei’ichiro Watanabe at Nagoya University, three-dimensional shape models for Ryugu were constructed based on the ONC-T images. These were used to explore how the combined gravitational and centrifugal forces over the asteroid surface would change if the spin was increased. For the asteroid shape to be formed from spin, the centrifugal force must drive landslides towards the equator. This occurs when the forces felt by grains on the surface exceed the maximum frictional force that counters their slide. The surface slopes of the asteroid then become close to the critical slope for the landslide of the constituent material, and a spinning-top is formed. Slope maps (representing the strength of the gravitational and centrifugal forces) on Ryugu for different spin periods. Yellow shows regions of structural failure, where the material can reshape due to the gravity and centrifugal force. Figure from S. Watanabe et al, Science 10.1126/science.aav8032 (2019). Analysis of the shape model of Ryugu showed that the critical slope occurs at a rotation rate of 3.5 hours, which is where the centrifugal force is nearly equal to the asteroid’s gravity in strength. This likely means that Ryugu was spinning at twice its current rate in the past. The spinning-top shape may have happened as Ryugu formed from re-accumulated material from the fragmented parent body. However, Watanabe’s group proposes that it would be difficult to achieve the necessary high rate of spin while avoiding asymmetries which would create an elongated lumpy potato shape. A second possibility is the asteroid began as a more spherical body but was spun-up by the Sun’s radiation (YORP effect) which then squashed Ryugu into a top shape. Part of the material pushed towards the equator would escape, causing the asteroid to gradually slow once again over time. The ONC-T is equipped with seven different filters, enabling the identification of different wavelengths in the light (the “spectrum”) reflected from Ryugu’s surface. While the differences were not found to be strong across the asteroid, Ryugu’s equatorial ridge shows a blue-ish tinge compared to the redder material at mid-latitudes. This slight dichotomy could be explained by the redder material being more weathered by sources such as solar radiation compared to the blue. If material slid down Ryugu’s spinning-top slope, then fresh unweathered material could be becoming visible at the equator. This is a theory that we will ultimately be able to confirm. In October last year, the MASCOT lander developed by the German and French space agencies, touched down to analyse a site in the mid-latitudes. Then in February, Hayabusa2 descended to collect a sample of material near the equatorial ridge. When Hayabusa2 returns this sample to Earth at the end of 2020, surface data from the two regions can be compared. The remote sensing instruments onboard Hayabusa2, including the ONC-T and NIRS3. The colour spectrum of Ryugu from the ONC-T filters can also be used to compare asteroids to hunt down Ryugu’s parent within the asteroid belt. The best matches are asteroids Eulalia and Polana, known parent bodies of other C-type asteroids in the inner part of the main asteroid belt. These asteroids broke-up into their families of fragments around 830 and 1400 million years ago, respectively. Ryugu may have been a direct descendent of this break-up, or it may have formed in a subsequent generation of disruption. Prior to the arrival at Hayabusa2, the asteroid Erigone was considered a likely parent. However, both Ryugu’s colour and infrared spectrum dismissed this possibility. While reflected optical light is captured by the ONC-T camera, infrared light from Ryugu is analysed by the near-infrared spectrometer (NIRS3) onboard Hayabusa2. The near-infrared spectrum can indicate the presence of hydrated minerals which absorb wavelengths close to 3 microns, causing that wavelength to be missing in the reflected infrared. But while Ryugu was expected to absorb strongly at this wavelength, only a weak signature was seen. In a paper led by Kohei Kitazato at the University of Aizu, the near-infrared spectra of 69,000 sites covering 90% of Ryugu was analysed. 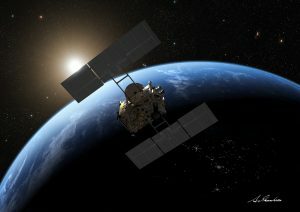 The surface absorbed weakly at 2.72 microns all over the asteroid, suggesting the global presence of minerals that have experienced water but now have only a low level of hydration. As this nearly homogenous distribution had also been seen in the optical spectrum from the ONC-T, it led to the question of what would cause such uniformity and why the hydration level was so low. Schematic illustration of Ryugu’s formation. Ryugu formed from the re-accumulation of material ejected from an original parent body by an impact, possibly through an intermediate parent body (lower stages). Three scenarios could explain Ryugu’s low hydration: the parent body may have experienced strong internal heating from radionucleotides, alternatively the parent body may have been heated by impacts but this is less likely to produce uniform heating. The third scenario is that the parent body formed from only partially hydrated minerals, such as interstellar dust particles, IDPs. Figure from S. Sugita et al., Science 10.11.26/scinece.aaw0422 (2019). Ryugu’s rubble pile structure could provide the first answer. 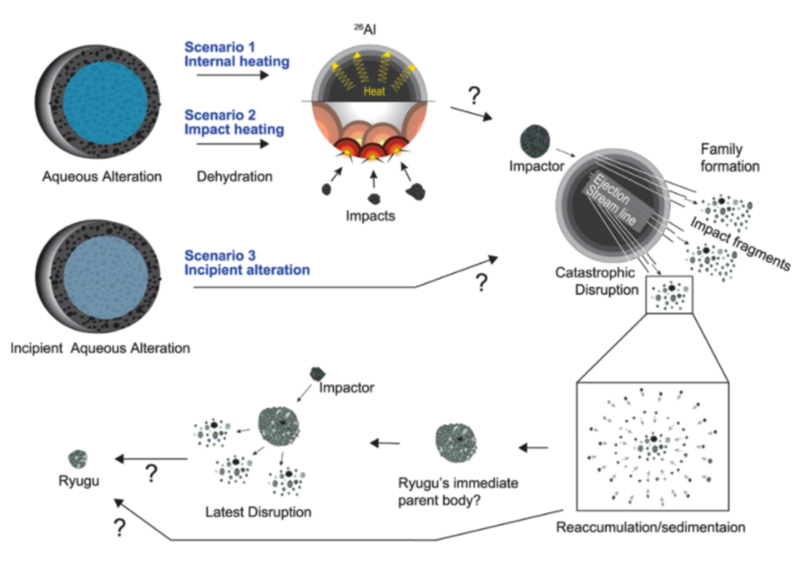 Simulations performed by Sugita’s team found that bodies that re-accumulate from the fragments of a disrupted parent can contain a mix of material from all depths of the original asteroid. This explains why the composition of individual boulders on Ryugu appears similar, apart from a small number that could be from the upper layers on the parent body. It also suggests that Ryugu did not lose water after its formation, but rather the entire parent body was water-poor when it fragmented. Such a result has implications for the motion of water through the early Solar System. One possibility for this loss is that Ryugu’s parent formed early in the Solar System history, allowing it to become packed with radioactive nuclides such as 26Al. 26Al radioactively decays into the stable 26Mg with a half-life (the time taken for half the atom of 26Al in a sample to decay) of about 0.7 million years. Over time, the quantity of 26Al has therefore decreased in the Solar System, so Ryugu’s parent would have to have formed early in order to acquire enough to experience internal heating to dehydrate its minerals. The second option is impact-heating. Collisions with Ryugu’s parent body may have partially dehydrated the material. Impact heating is a heterogeneous process, occurring at the site of the collision rather than evenly through the whole body. However, multiple impacts could produce a relatively uniform heating process. While Ryugu’s parent body is expected to have undergone many such collisions, it is less clear if these were intense enough to cause the excessive dehydration throughout the rock. There is also the possibility that Ryugu never contained highly hydrated minerals. In which case, the asteroid might be composed of material similar to interplanetary dust particles (IDPs). Ryugu is an extremely dark object in both optical and infrared, darker than any other previously visited small body and most laboratory spectra of carbonaceous chondrites. This implies a highly absorbing compound throughout the asteroid which is hard to pin down. If the asteroid consisted of IDP-material, it might be heavy in carbon. However, there is no spectra of IDPs in the range of the NIRS3, so a direct comparison cannot be made. Moreover, the boulders on the asteroid surface are not dust balls, so if this is the origin of IDPs, then something must break up the boulders to create dust before arrival at Earth. This first remote analysis of Ryugu has painted a picture of an asteroid with a complex history of events. Each of these marks a step in how our own planet formed. When Hayabusa2 returns to Earth at the end of 2020, it will bring with it samples of asteroid material. This global analysis combined with a laboratory close-up will allow us to narrow down the extraordinary passage of water, organics and other materials through our planetary system to form a habitable world.